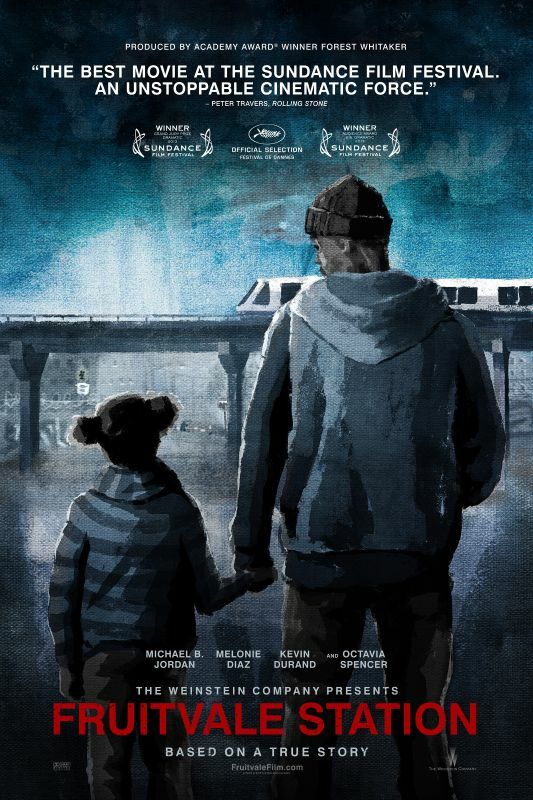 Writer/director Ryan Coogler's debut feature, Fruitvale Station, is one of those first films that announces that a major talent has hit the scene. It's a humanistic, deeply observed portrait of a 22-year-old African-American named Oscar Grant (Michael B. Jordan), a name that might be familiar to some from headlines a few years ago. Grant is an ex-convict trying to do right by his girlfriend Sophina (Melonie Diaz) and their beautiful kindergarten-age daughter Tatiana (Ariana Neal), as well as his strong-willed mother Wanda (Octavia Spencer). Coogler begins the film with grainy cell-phone footage of what appear to be cops lording over a group of handcuffed men, and the antagonism between the groups grows violent. Immediately after that, we are introduced to Oscar in bed with Sophina as the two have a conversation about how committed he is to her. With this one intimate scene, Coogler establishes his lead character's emotional makeup. He's volatile, both quick to anger and quick to love, but not in a cartoonish way. Jordan has the ability to turn on a dime emotionally and then turn back within a single scene, and it's a riveting performance. He's helped greatly by the rest of the cast, who all act as if they are used to this behavior from Oscar. When he gets mad, he's not threatening; he's just upset and they know he will cool down. Not much happens during the movie's first hour aside from a nearly documentary-like presentation of a day in Oscar's life, during which he helps throw a birthday party for his mother, tries to convince his ex-boss to rehire him, and goes to San Francisco with his girlfriend for a fun New Year's Eve. However, the last act of the film returns us to the scene presented in the opening images, and as those moments play out, Coogler's achievement becomes apparent. Fruitvale Station feels like Spike Lee's Do the Right Thing, if Lee's major influence had been John Cassavetes instead of Vincente Minnelli. In 60 minutes we get a full portrait of what Oscar's life is like, and we understand what he has to overcome -- both internally and externally -- in order to become the person he wants to be. The events at the end of the movie remind us that tragedies happen on a daily basis, and they can happen to anyone at any time. It's a picture that could easily and rightfully dwell in righteous anger, but Coogler has much deeper goals. He's made a film that, with a low-key style that gets under your skin, poignantly affirms the difficulty, beauty, and preciousness of life.